axis bank blogadda Digital Axis - Meet the Axis Acquaintance! Digital Axis - Meet the Axis Acquaintance! I attended the 'Make the Axis acquaintance' blogger meet last weekend. It was held at the Axis Bank Building in the Bombay Dyeing Mills compound. It was a meet that highlighted few essential features of mobile banking and various features of Axis mobile banking application. I would like to inform you that this application is a simple, user friendly, convenient and a secure mobile banking application. Please read secure! I lay high emphasis on this word secure as I realized that this had quite brilliant security features. The world is moving rapidly and everyone is running in the rat race. We hardly have time to stop and share conversation with bystanders. Earlier people used to physically walk to their bank for banking transactions. This was made easier and convenient through net banking. So you don't have to travel to your bank and you can sit with a pc or a laptop with a working internet connection and make transactions online. The world is getting smart and smart people often demand smartness in everything that they do. So was invented mobile banking. With internet connection on your smart phone, you could carry on all your transactions. So you can do everything with one click. Let’s talk about Axis mobile application. 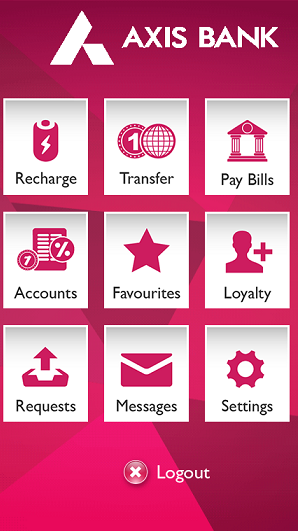 This application has been designed for customers holding Axis bank Savings, Current account, and credit card. You could download this application from Android Playstore, Apple AppStore, Windows for Nokia phones. You could even check it from Mobile web. Of course every facility has its own list of features. This application is said to have more than 50 features. I would cite few important features here. We all know that for transferring money from your bank account to someone else's you need to add a beneficiary. Usually most banks have this facility to add beneficiaries from net banking through its website. But with Axis Mobile, you could instantly add the beneficiaries and transfer funds instantly. You would view and schedule bill payments. You could also recharge your DTH and your mobile phones. This application allows claiming reward points that is unique to Axis bank. It allows you to view unbilled transactions and pay credit card bills. It has a sim locking feature where on boarding is allowed only with the bank registered mobile number. Every transaction is followed by punching the MPin and this is crucial as it adds extra security. It also allows to place requests to block and replace your debit and credit cards hassle free. You could also set your daily transaction limits too. It also gives you the option to get your app account terminated if your phone is lost or stolen. This application finds offer near you - various restaurant offers. It allows you to add photo's from your phone for your accounts and your beneficiaries. You could view and redeem Edge Loyalty Point at any time. The Axis Bank official Pramod briefed us about their offerings. It was indeed one good app to look out for. The features were really promising. My own mobile banking application has limited features and I think that this app stands out ahead! It was an interactive session where bloggers who attended the session asked various questions. The officials answered their questions and cleared all their doubts. Post session ,we had a sumptuous meal arranged at the canteen. To sum it up, it was a very good session where we witnessed the Axis bank mobile application. Now, get a better car through Quikr NXT! Quickr NXT - No Fikar, Chat Quickr!